As Nigeria works to stabilize from years of warfare in its north, the deadliest threat is not the Boko Haram extremist movement, but escalating battles between farming and herding communities over scarce land and water. Bloodshed has increased since January, as armed groups have attacked and burned villages; more than 1,300 were killed and 300,000 uprooted in the first half of 2018. But amid the violence, local peace efforts have made progress. Nigerian government officials and civil society groups are now building on those local successes. In the face of the warming climate and population growth worldwide, Nigeria’s struggle to manage herder-farmer conflict is relevant for nations from Africa to Asia that face similar violence. In August, government, police and civil society leaders gathered in a meeting that was rare for its breadth of participants—from government, police forces and civil society. Over two days in Abuja, Nigeria’s capital, participants warned that communications between farmer and herder communities have declined, and mistrust of security services is high. The participants committed to expanding dialogues among communities, security forces and government institutions, both in zones of conflict and in making national policies. The meeting was convened by USIP; Nigeria’s Institute for Peace and Conflict Resolution, a government-funded think-tank; and the office of Vice President Yemi Osinbajo. The clashes over land and water have arisen as drought and desertification in the Sahel region have forced nomadic herding communities in the north and central parts of Nigeria to seek grazing lands further south. Rapid population growth in much of Nigeria has pushed farmers into unsettled land traditionally used for cattle grazing. The growing use of commercial fertilizers means farmers no longer rely on dung from herders’ animals for fertilizer. Since many farmers and herders live at a subsistence level, changes such as these threaten their ability to survive. African nations from Cote d’Ivoire to Sudan, and countries such as Afghanistan and India, also face conflicts among farming and nomadic herding communities. Worldwide, hundreds of millions of people in more than half the planet’s nations depend on grazing livestock, the United Nations’ Food and Agricultural Organization says. More than a quarter of Africans—about 268 million people—rely on grazing, and they live across 43 percent of the continent’s land area, the African Union estimated in a 2013 report. Yet “access to productive rangeland” is decreasing and few governments have institutions and policies to manage the kind of conflict that has spiked in Nigeria, the report said. As in many such conflicts, Nigeria’s farmer-herder clash has taken on ethnic and religious overtones. 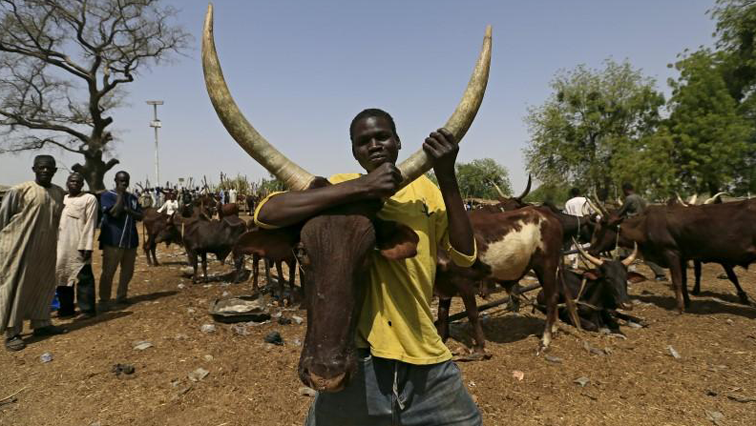 Many of Nigeria’s herders are ethnic Fulani and Muslims, while most farmers are Christians. The violence has escalated this year—notably in the states of Nigeria’s “Middle Belt” region—as armed factions have acquired more weapons. Nigeria’s federal and state government efforts to reduce the conflict have had mixed results. Federal authorities have proposed, but not yet implemented, establishing land reserves for grazing; meanwhile the states of Benue and Taraba have banned open-range grazing. Security responses—military operations across six states, and additional police—also have been only partially successful. Human rights violations, allegedly including excessive use of force and arbitrary arrests by security forces, and failure to follow up arrests with investigations and prosecutions, have alienated people on both sides of the conflict. Local efforts have had more success, albeit on a smaller scale. Traditional leaders in some areas have mediatedagreements that have provided settlements to farmers for damage to crops by livestock, while also preserving herders’ opportunities to graze their animals. Still, such grassroots initiatives have been spotty across the areas facing violence. And while community groups working outside formal system are beginning to gain recognition from the government they are seldom well integrated with state-level security responses or included in policy-making. The August conference in Abuja discussed ways to address conflicts based on a USIP problem-solving method used recently in Jos, the capital of Plateau State. Residents in a northern Jos district clashed with the police, burned down a police station and refused to let officers re-enter their community. Over two years, USIP and its Nigerian partners used the Institute’s “Justice and Security Dialogue” process to restore police-community relations. Now police and community groups in Jos North are working together to fight drugs and crime and prevent violence during upcoming elections. They have together built a new police station to replace the one destroyed by an angry mob. The problem in Jos—a catastrophic loss of trust and communication between a local community and security forces—happens often in countries subject to violent conflicts. To repair that breach, USIP first developed the Justice and Security Dialogue process a decade ago for use in Nepal following its civil war. Since then, the Institute has used it successfully in a dozen countries, including Nigeria and several of its neighbors in the Sahel region. The Jos example has led Nigerian state and national-level officials to express interest in using this dialogue process more broadly. Plateau state, about the size of the U.S. state of Maryland with 3.5 million residents, is among several Nigerian states that have established peacebuilding offices. That unit, the Plateau Peace Building Agency, this year launched a five-year plan to reduce violence such as the farmer-herder clashes. The agency has expressed interest in applying the dialogue model used in Jos to the state’s other violent clashes, which have included conflicts over land and resources. Participants at the August conference in Abuja said the lack of communication at local levels amid the farmer-herder clashes is hardening each community’s negative view of the other. Rumors and mis-information about violence circulate freely, often triggering new violence. The participants drafted a joint analysis of the conflict and agreed on immediate steps to be taken in each state. For community leaders, periodic problem-solving meetings can diffuse local tensions before they escalate. For police, a strong dialogue with a given community makes them more informed and effective, ensuring they are responding to real community needs. At the national level, federal government representatives agreed to continue meetings with community leaders to draw on their experiences in shaping federal policies. In the short term, participants said, the new effort, focused by the Abuja meeting, may improve peacebuilding across a number of states. For the long term, they voiced hope that by using the Justice and Security Dialogue approach to support and connect local, state and national efforts to address the farmer-herder crisis they can build the trust, understanding, and willingness to compromise that is necessary for a durable solution. About the Authors: Ena Dion is a senior program officer and Isioma Kemakolam is a program coordinator at the U.S. Institute of Peace.